Next time when you find yourself hooked up behind the wheel, make sure your car is actually in your control. Hackers can remotely hijack your car and even control its brakes from 12 miles away. Car hacking is a hot topic. Today many automobiles companies have been offering vehicles with the majority of functions electronically controlled, from instrument cluster to steering, brakes, and accelerator. These auto-control electronic systems not only improve your driving experience but at the same time also increase the risk of getting hacked. 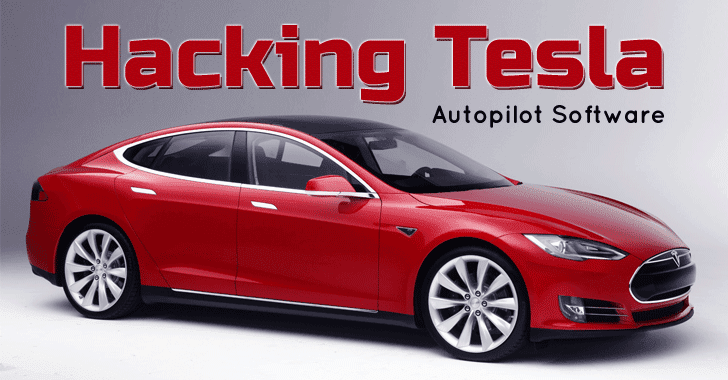 The most recent car hacking has been performed on Tesla Model S by a team of security researchers from Keen Security Lab, demonstrating how they were able to hijack the Tesla car by exploiting multiple flaws in the latest models running the most recent software. The team said the hacks worked on multiple models of Tesla and believed they would work across all marques. "We have discovered multiple security vulnerabilities and successfully implemented remote, aka none physical contact, control on Tesla Model S in both Parking and Driving Mode," Keen writes in a blog post. "We used an unmodified car with the latest firmware to demonstrate the attack." In a YouTube video, the team of Chinese researchers Sen Nie, Ling Liu, and Wen Lu, along with director Samuel Lv, demonstrated how it could remotely take control of a Tesla’s brakes and apply the brakes from 12 miles away by compromising the CAN bus that controls many vehicle systems in the car. The researchers were also able to remotely unlock the door of the car, take over control of the dashboard computer screen, open the boot, move the seats and activate the indicators and windscreen wipers, as well as fold in the wing mirrors while the vehicle was in motion. The hack requires the car to be connected to a malicious WiFi hotspot and is only triggered when the car's web browser is used. The team demonstrated the hacks against a Tesla Model S P85 and Model 75D and said its attacks would work on multiple Tesla models. It was able to compromise the Tesla cars in both parking and driving modes at slow speed in a car park. "Within just 10 days of receiving this report, Tesla has already deployed an over-the-air software update (v7.1, 2.36.31) that addresses the potential security issues. The issue demonstrated is only triggered when the web browser is used, and also required the car to be physically near to and connected to a malicious Wi-Fi hotspot. Our realistic estimate is that the risk to our customers was very low, but this did not stop us from responding quickly." "We engaged with the security research community to test the security of our products so that we can fix potential vulnerabilities before they result in issues for our customers. We commend the research team behind today’s demonstration and plan to reward them under our bug bounty program, which was set up to encourage this type of research." Thankfully, the vulnerabilities were privately disclosed to Tesla and the company addressed the issues worldwide with an over-the-air software update. The Keen team said it is Tesla’s "proactive attitude" towards its vulnerability report that made the fix available to its customers within ten days when other automakers required much time and more complex procedures to update vehicles following the major bug exposures. The team has planned to release details of its hacks in coming days, Keen said on Twitter.